Notes: I followed Elizabeth Zimmerman’s pattern and incorporated Jared Flood’s notes on his design elements since I was so enamored with Big Blue. 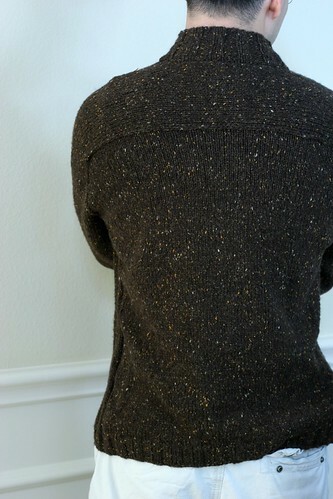 I went ahead and knit it back-and-forth as he did, without thinking about it. In retrospect, though, I deprived myself of a great opportunity to make it in the round and learn steeking. Oh well–next time. Since my yarn is a DK rather than a worsted weight, I made the ribbing 3x3 instead of the 2x2 ribbing used in Big Blue, just for better visual impact. I followed the pattern directions for sleeve increases. It looks fine, but it is different than what I’m used to. The increases all take place below the elbow, whereas I’m used to having them tapered throughout the length, up to the armhole. 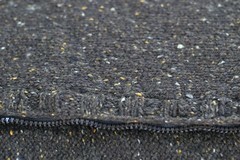 Two zipper facings were knit so that the zipper could be sandwiched in between. 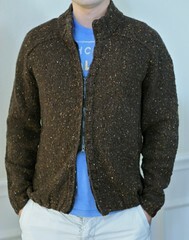 The front zipper facing was made by picking up stitches from the front edges and knitting in 3x3 rib. 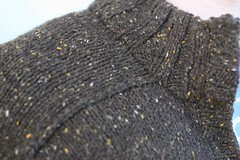 Then, stitches were picked up from behind those and knit in stockinette for the back zipper facing. The back facing was knit 2 rows shorter than the front, with the idea being that the longer front facing would help hide the zipper teeth. The zipper was sewn to the back zipper facing by machine and then to the front zipper by hand. 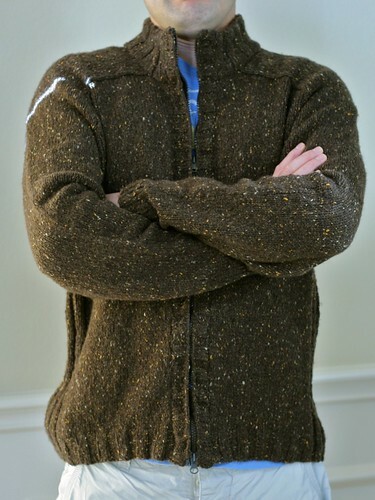 My husband chose a parka-style separating zipper, and I love how it opens from the top and from the bottom. 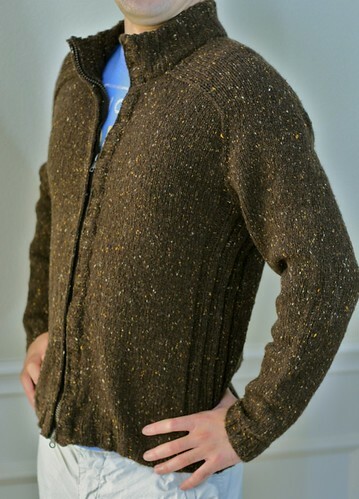 The collar was initially kind of floppy, so after knitting the collar to the desired height, I did a purl turning row, reversed the ribbing pattern and continued on until the height was doubled. This way, after the collar was folded down at the turning row, the two sides nested against each other and made for a sturdy collar that was not too terribly bulky. 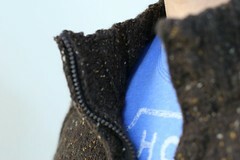 I've never sewn a zipper on a knit garment before, and I've always wondered how one can get it to look smooth. I really like the idea of thedual zipper facing and machine sewing the zipper to the back facing.